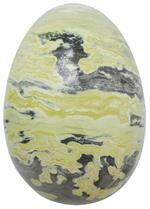 Item #GSE-285: 152mm greenish yellow with gray mottling Serpentine/Augite egg. 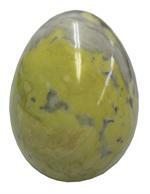 Item #GSE-419: 3.25" tall Serpentine/Augite Egg (Arizona) ; 366.70 grams. 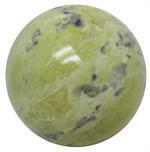 Item #GSE-181: 76mm yellowish green with gray mottling Serpentine/Augite sphere (Arizona).